With blog responsibility comes the struggle for creativity. I've been approached by a lot of different companies, both big name and indie-size, about doing reviews of polishes and tools and decorations. I always like to try new things and show you guys what's out there, so I'm usually inclined to say yes. With so much traffic in my inbox though, it's easy to lose sight of the nail art love behind the blog, and focus efforts on giving good reviews. Tonight, I just opened up some drawers in my polish storage and picked out a few good colors. A simple pink, Parfait Day from Lime Crime, and my trusty Black Onyx from OPI, as well as Purity from Zoya. Pink. Black. White. Simple. In keeping with the simplistic theme, what better than stripes and dots. Easy, clean, and refreshing. Ah it feels good to breathe beautiful! When I saw the picture of this manicure on fb, before I even read this, I thought to myself "Wow, I forgot what a simple, pretty manicure can look like." Thank you! A simple but very pretty, girly look. Love it! Cute! I love how great the stripes work with the dots. I love this mani! 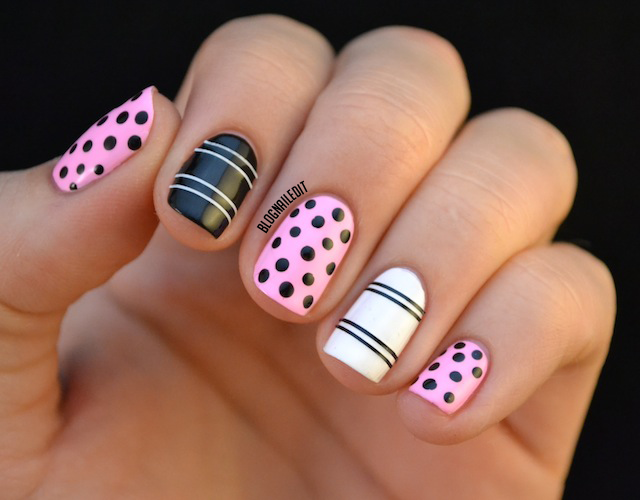 Pink with black dots is so chic and classy. You have a few other styles together to complement them. What a medley of prettiness. With all of the craziness that comes with running a blog, sometimes you really do just need to do a mani JUST for you! I adore this clean, classy, gorgeous look! Oooh, I have to work on my skills :D .
Very pretty! It looks so simple and pulled together. I gotta say, though I do love the reviews I miss the beautiful nail art that you and some other amazing bloggers do. These are wonderful! This is just lovely! You can't go wrong with classic polka dots and stripes! Pink, black and white look fabulous together! Absolutely gorgeous! So simple but so pretty. Love it! I love this - so simple and clean. So simple, still so pretty. Is that striping tape on your nails or did you use it to make the stripes with polish and remove it? It's just black and white striping tape.